Luck smiled on me the next day, and I managed to steal a bundle of rags off the back of a wagon and sell them to a ragman for four iron pennies. Too hungry to worry about tomorrow, I bought a thick slice of cheese and a warm sausage, then a whole loaf of fresh bread and a warm apple tart. Finally, on a whim, I went to the back door of the nearby inn and spent my final penny on a mug of strong beer. The abundance of the Waystone is worlds apart from the streets of Tarbean. In either place, the comfort of warm apple tart isn't something our innkeeper is likely to have forgotten. *I used Braeburn apples which weighed around 120g whole; 75g after being peeled, cored and diced / sliced. Preheat oven to 175°C (350°F) fan assisted. Grease the tartlet tins and line the base and sides with your ready-made puff pastry. Set aside. For the apple tart filling, melt the butter, sugar and cinnamon together on a low-medium heat until the sugar has dissolved (around 3 minutes). Add the diced apples to the sweet butter and cook until they're slightly softened (around 5 minutes). They should be neither too crunchy nor too mushy. Turn the heat to medium-high, add the brandy and cook for an extra minute. Then turn the heat back down to low-medium, add the corn flour and stir until your apple filling has thickened. Stir in the chopped walnuts. Divide the apple filling between your pre-prepared puff pastry tart cases. 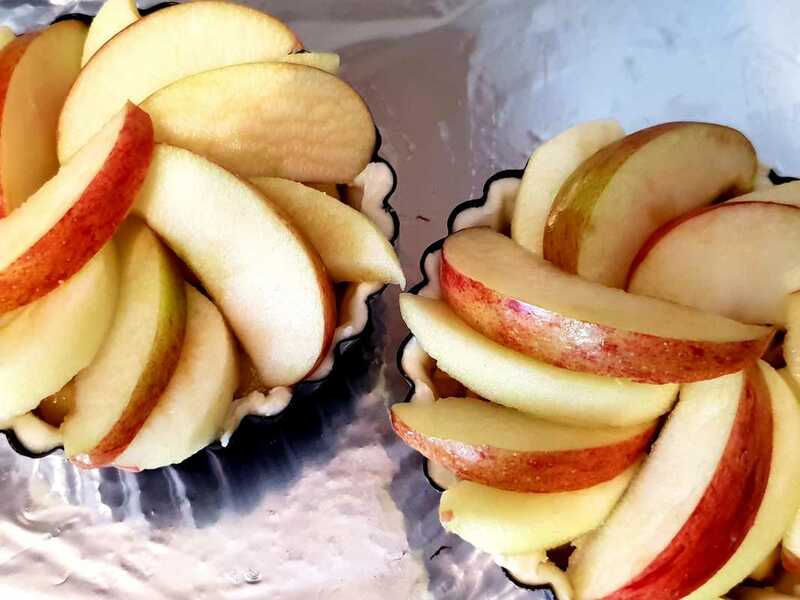 Arrange the apple slices on top, alternating peeled and unpeeled to form a spiral pattern. 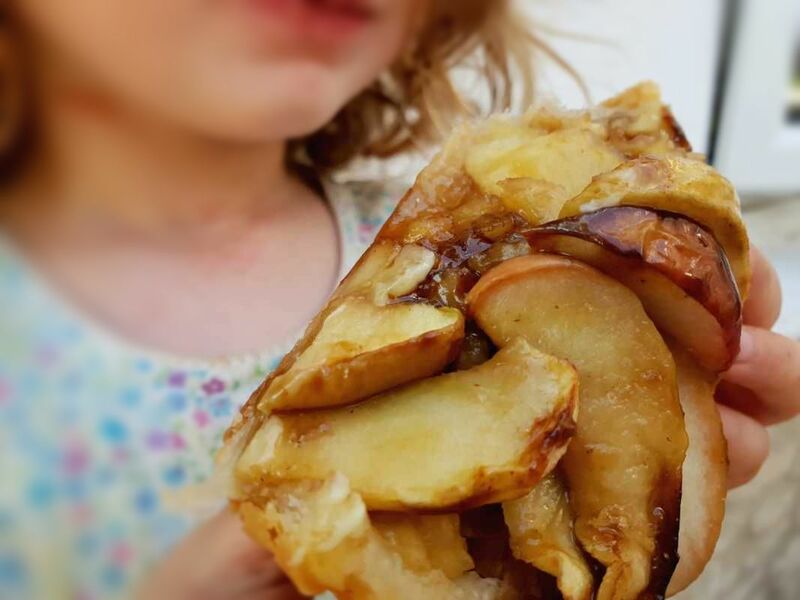 Note: You may not use all of the sliced apple – go by what fits. See picture below for guidance. Bake for 22 minutes. The puff pastry visible around the sides of the tarts should be golden brown. Remove the tarts from the oven and allow to cool down from 'scorching hot' to 'warm' before removing from their tins. Meanwhile, make the sticky sauce. Melt the butter and sugar together on a medium heat until the sugar has dissolved (around 3 minutes). Cook for an extra 2 minutes stirring continuously. If the sauce is too thick to slide off a spoon, add a small amount of water and stir to loosen. Aim for a sticky drizzle, not a watery soup. Divide the sticky sauce between the two tarts, drizzling it over the apple slices for a sweet glaze. Don't feel obliged to use all of the sticky sauce if the tarts seem complete without it. Enjoy warm.